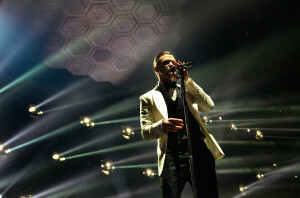 Pop superstar and Memphis native, Justin Timberlake brought his suit-and-tie clad 20/20 Experience Tour to an ecstatic sold out crowd of hometown fans at FedExForum on November 18th. Monday night’s spectacular two set, 30-song, performance included an 11-piece band equipped with a mighty horn section, backup singers, and choreographed dancers. Fans experienced three hours of memorable hit songs and even some unexpected covers including Elvis’ “Heartbreak Hotel” and Michael Jackson’s “Human Nature”. Of course, the show’s production was also something to marvel at. The stage stretched the entire width of the arena, and had two tiers; with the top tier being able to move to different elevations over the crowd. There was also an incredible array of mammoth-sized video walls, lighting, and even some special effects, which made the whole experience seem larger-than-life. The 20/20 Experience World Tour kicked off its nearly 75-city arena tour spanning 15 countries, in New York City at the Barclays Center on November 6th. The performance at FedExForum was his eighth stop on the expansive tour. Timberlake’s show in Memphis is another impressive addition to what is being called FedExForum’s ‘busiest fall‘ in its nine-year history. All Content © 2009-2018 Crew One Productions, Inc.. & all respective owners. No part of this website may be copied or used without consent. Website Administered and Maintained by Dame Saint Orleans Nashville, TN.